Available exclusively on the WebRater, Cyber Gold is DUAL’s new Cyber offering which has been designed specifically for the micro SME market with up to $5,000,000 turnover. There are 2.1 million private companies in Australia, with 97% of these considered to be ‘s of SME' companies employing less than 20 staff. Research suggests that SME's are the most exposed to a cyber-loss due to their limited resources and knowledge of Cyber risks and security. The average cost of cyber-crime for an SME is $10,299 with fines up to $1,800,000 for businesses who don’t comply with the mandatory Data Breach Notification laws introduced in 2018. Would your client be able to survive that sort of loss? Why has DUAL launched this product? Cyber Gold is based on the same wording as the existing Cyber Platinum offering and removes the barriers SME’s face in purchasing this cover by providing the same breadth of coverage as the existing Cyber Platinum offering except for certain deductibles and sections which are sublimited as per the schedule. With limits between $25,000 and $1,000,000 available and pricing starting from $120 plus charges, this product meets the needs of micro SME clients looking to purchase a standalone Cyber policy, with cover commensurate to their required price point. 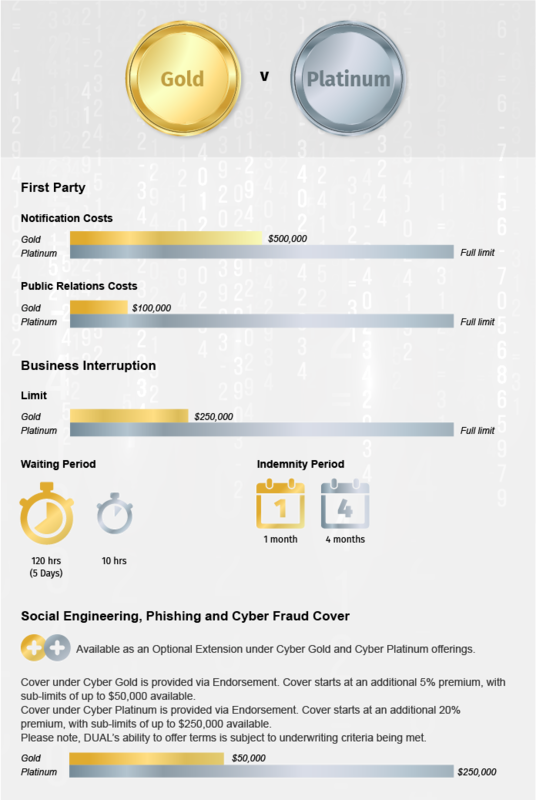 For a detailed overview of the Cyber Gold Product, click here for a copy of our Open Market Cyber Gold profile. If you need further information please contact your local DUAL Underwriter.